Beijing studio MAD Architects has shared two separate design proposals for the eventual home of the Lucas Museum of Narrative Art, a project backed by renowned Star Wars filmmaker George Lucas. After initial plans to build the museum in Chicago were nixed late last year following public backlash, Lucas set his sights on the West coast, but the final location for the museum has yet to be determined. As a result, MAD created designs for San Francisco and Los Angeles, each uniquely customized to integrate into the proposed sites. MAD principal architect Ma Yansong worked on the two designs for the Lucas Museum at the same time and while they have some common features, the two proposals are also very different. The design for San Francisco seats the museum on Treasure Island, an artificial island in San Francisco Bay which is a former military site that now holds a host of tourist activities. The proposed design is for a fluid, tapered structure that is elevated from street level, creating a pedestrian space underneath the museum. 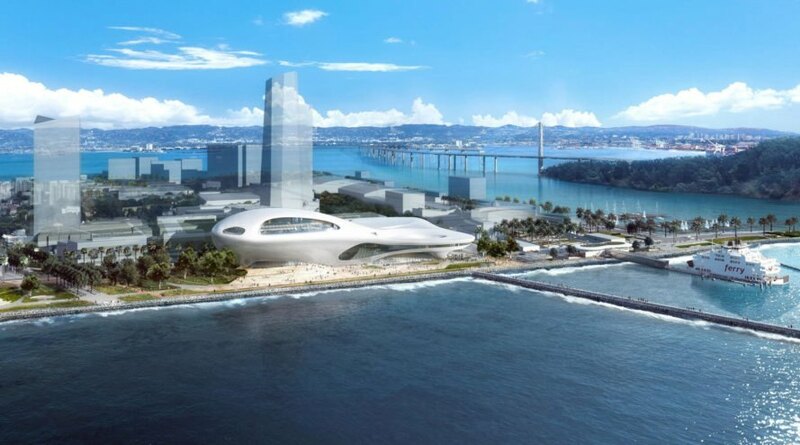 This would integrate the museum into the waterfront without robbing the public of precious surface spaces. In protecting the public space, MAD’s museum design meshes with architecture firm SOM’s master plan for Treasure Island. The second design is for Exposition Park in Los Angeles, where the Lucas Museum would neighbor the Natural History Museum and Coliseum. The LA version of the proposed museum protects public spaces in much the same way the San Francisco design seeks to do, but also creates additional public space in the form of rooftop terraces featuring living trees and other plants. The museum would sit on a sprawling green lawn, where visitors could enjoy nature or host a picnic in conjunction with their art appreciation. An underground parking garage with space for around 1,800 vehicles is also incorporated into the LA design. Each design proposal offers around 100,000 square feet of gallery space, which is a third of the size of the since-abandoned Chicago proposal after it was scaled down to 300,000 square feet. Reportedly, Lucas will decide on the proposed museum’s location within the next four months, but there’s no word on whether he’ll accept the design created for that city. It’s entirely possible we will see another round of design revisions in the early part of 2017, much like the Chicago project endured several updates. In the meantime, art lovers can take a sneak peek at the Lucas Museum’s collection, thanks to this special feature compiled by the San Francisco Chronicle. The second design is for Exposition Park in Los Angeles, where the Lucas Museum would neighbor the Natural History Museum and Coliseum. The LA version of the proposed museum protects public spaces in much the same way the San Francisco design seeks to do, but also creates additional public space in the form of rooftop terraces featuring living trees and other plants. The museum would sit on a sprawling green lawn, where visitors could enjoy nature or host a picnic in conjunction with their art appreciation. An underground parking garage with space for around 1,800 vehicles is also incorporated into the LA design. Each design proposal offers around 100,000 square feet of gallery space, which is a third of the size of the since-abandoned Chicago proposal after it was scaled down to 300,000 square feet. Reportedly, Lucas will decide on the proposed museum’s location within the next four months, but there’s no word on whether he’ll accept the design created for that city. It’s entirely possible we will see another round of design revisions in the early part of 2017, much like the Chicago project endured several updates. In the meantime, art lovers can take a sneak peek at the Lucas Museum’s collection, thanks to this special feature compiled by the San Francisco Chronicle.